Researchers have discovered a new fossil specimen of the ancient Archaeopteryx, an early bird that lived around 150 million years ago. The new fossil shows that the ancient specimen was covered completely in feathers, which may give clues to the evolution of feathers. Scientists have come to the conclusion that feathers may have not always been used for flight, but instead were used solely for flashy displays. The preservation of the feathers from the newly found Archaeopteryx fossil helped researchers come to this conclusion. However, unlike modern birds of prey, the early bird may not have been able to fly. 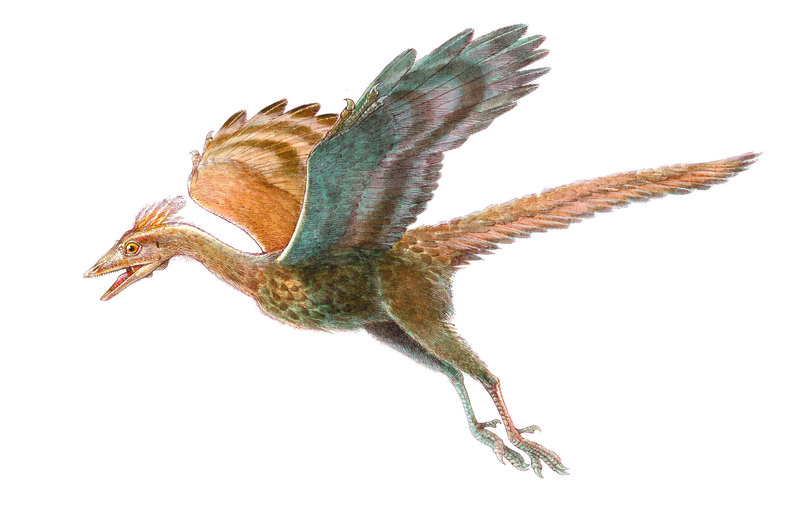 Both the tail feathers and the wing feathers indicate that the Archaeopteryx could fly, but the symmetrical hind limb feathers indicate that it could not. “There are a number of indications that Archaeopteryx was capable of aerial locomotion, but just how well it could fly remains debated,” Rauhut said. He added that researchers are unsure if it was a non-avian dinosaur or a bird. Evidence has pointed to the Archaeopteryx following the same evolutionary pattern as birds, however. The evidence also suggests that both the early bird and its predecessors were bright and flashy. Like modern birds, the flashy colors were most likely used in displays, such as for mating. Although the quill-like contour feathers were most likely used for colorful displays, the proto-feathers probably evolved for regulating body temperature.